Fr. Thomas enumerates the seven great messianic signs of Jesus in St. John's Gospel, focusing on the healing of the paralytic at Bethesda. 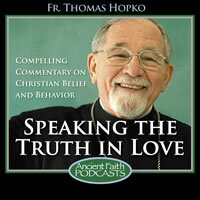 As we begin the Lenten fast, Fr.Tom reflects on the 40 days Christ spent in the desert being tempted by Satan. Learn how some churches actually promise things that Christ rejected in the desert. Fr. Thomas examines who the myrrh-bearing women were and clears up some misconceptions about Mary Magdalene in the process. The third Sunday of Pascha in the Orthodox Church is dedicated to the memory of the myrrh-bearing women, the women who ministered to Jesus during his lifetime, who stood afar off watching the crucifixion—although in St. John’s gospel they are closer—and those who came to the tomb on the first day of the week seeking to anoint the corpse of Jesus, the dead body of Jesus, for his burial.